Issues of reputation management are negotiated in a wide array of contexts, yet arguably one of the most visible of these areas involves how such stories unfold within the sporting arena. Whether involving individual athletes, teams, organizations, leagues, or global entities, the process of navigating issues of image repair and/or restoration and crisis-based communication has never been more byzantine with a plethora of communicative media outlets functioning in myriad manners. 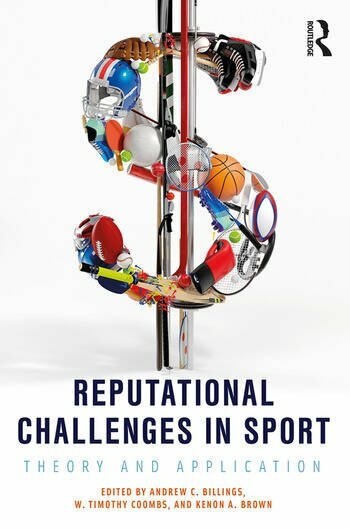 Reputational Challenges in Sport explores the intersection of reputation, sport, and society. In doing so, the book advances theory and then explores individual, team, and organizational applications from varied methodological perspectives as they relate to reputation and identity management and crisis orientations. The book provides a synthesis of previous works while offering a contemporary advancement of these subjects from a variety of epistemological approaches. It gives voice to variety of perspectives that offer a robust advancement of issues relating to reputation, sport, and modern society. Reputation, Crisis, and the Presumed Power of Narrative Manufacturing"
Chapter 1 "Athlete Reputational Crises:　One Point for Linking Situational Crisis Communication Theory and Sport Crises"
Chapter 2 "Image Repair Theory and Sport"
Chapter 3 "Experimentally Examining Crisis Management in Sporting Organizations"
Chapter 4 "Adding Narrative to the Situational Crisis Communication Theory: The Case for Crisis ‘Narrative Management’ in Sport"
Chapter 5 "Applying Situational Crisis Communication Theory to University Needs: A Case Study of the 2015 University of Missouri Crisis"
Chapter 6 "Knee-jerk Policymaking in Crisis Response: A Fumbled Play by the NFL"
Chapter 7 "Reputational Challenges in the Olympics: The LGBTQ Paracrisis in Sochi"
Chapter 8 "Crisis Communication and the NBA Lockout: Exploring Reactions to Crisis Strategies in Sport"
Chapter 9 "Empirically Studying Individual Athletes and Image Repair during Crises"
Chapter 10 "#14FOREVER: Nostalgia, Pete Rose, and the Cincinnati Reds"
Chapter 11 "Empirically Examining Image Repair Theory"
Chapter 12 "My Brand and the Team Brand; Where to Insert the "I" in Team?" Chapter 13 "The Role of Team Success and Failure in Mitigating Fan Dissatisfaction with Ticket Price Increases"
Andrew C. Billings is the director of the Alabama Program in Sports Communication and Ronald Reagan Chair of Broadcasting in the Department of Journalism & Creative Media at the University of Alabama. He also serves on many editorial boards, including as an associate editor of the journals Communication & Sport and Journal of Global Sport Management. W. Timothy Coombs is a full professor in the Department of Communication at Texas A&M University and an honorary professor at Aarhus University in Denmark. He is currently the editor of Corporate Communications: An International Journal. Kenon A. Brown is an assistant professor in the Department of Advertising and Public Relations at The University of Alabama.